Join us on Thursday 24th January at 7.30pm in St John’s to mark the 2019 week of Prayer for Christian Unity. Everyone is very welcome. 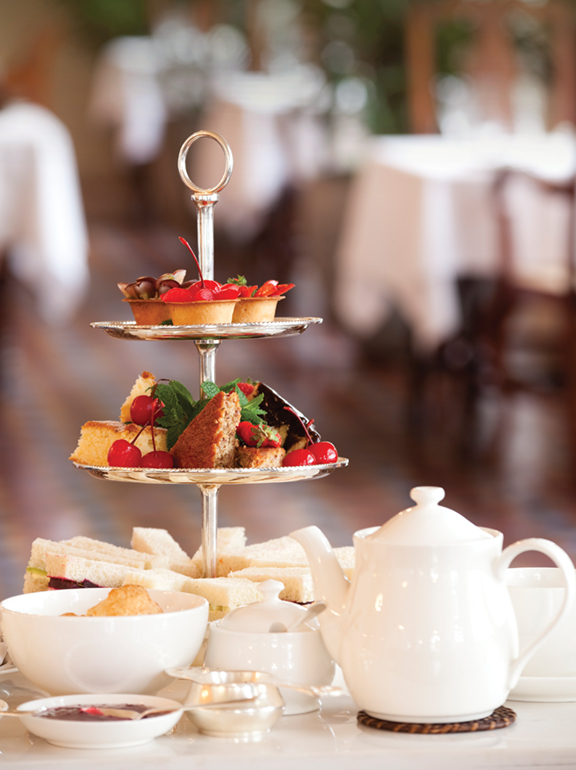 Refreshments will be served afterwards in the Parish Millennium Room. At this time of year, we circulate a donation envelope for Bishops' Appeal for World Development. It is right that we give special thought at this time of the year to supporting charitable work with people in need around the world. Your Bishops' Appeal envelope can be returned on any Sunday in December or to the churchwardens or by post to our honorary treasurer, Mr John Williamson, at 31D Dundrum Road, Newcastle BT33 0BG. The financing of the Spire renovation is of course in hand, and there was a very generous and swift response from many parishioners towards the costs, together with envisaged funding from the Heritage Lottery Fund. Not least in order to protect the structure, it is intended that the work will commence once the more extreme winter weather is past and when more favourable outdoor conditions arise. However, the state of our general funds is a different story. Because of their vulnerable state as we approach the end of 2018, the Select Vestry wishes to appeal to parishioners for assistance in that regard. Sellable Items required. Please contact 028 4372 4786 for arrangements for collection or drop off in hall on day off Sale. Volunteers also required for setting up of stalls on a Friday afternoon or selling on the day, and Tea /Coffee servers. If you wish to volunteer please contact Wendy at the above telephone number. Whilst our focus this year has been directed towards the Spire Appeal, St John's parish is projected to be £4,000 in deficit in its general funds on 31st December 2018. This will mean drawing from our relatively limited reserves of £20,000. However, in order to be properly solvent, the Select Vestry is required by the Charity Commission of Northern Ireland to have appropriate reserves. Withdrawing £4,000 from those reserves at the end of 2018 would leave us in a very vulnerable financial position. The Select Vestry therefore asks any parishioner who would wish to make an extra donation to our parish in light of these circumstances to do so by placing it in an envelope marked End of Year Appeal 2018 and handing it to the churchwardens, or by posting a donation for the End of Year Appeal to our honorary treasurer, Mr John Williamson, at 31D Dundrum Road, Newcastle BT33 0BG. The Select Vestry is concerned about the state of our general funds as well as our standing with the Charity Commission and therefore will greatly appreciate any help to offset our projected deficit. This year, for the first time, there will be a Christingle Service in St John's, on Tuesday 11th December at 7.30pm. What is Christingle? It is a service traditionally associated with Advent, with the theme being Christ, the Light of the World. That is what 'Christingle' means – 'Christ-light'. It is a very 'different' kind of service, appealing to young and older parishioners alike. The celebration is named after the Christingles that are lit during the service (we will have them ready in church). Christingles are made from an orange usually decorated with red tape, sweets and a candle. The lit candle represents Jesus’ light in the world. We hope that you will make a point of coming along to this service, and perhaps will bring some friends with you! It will be open to the whole community and I very much appreciate the help received from Sharon Williamson in making practical arrangements. It will be a new venture and I hope will inspire many people to think more deeply about the important underlying theme, Christ, the light of the world. Last month, I attended the Annual General Meeting of the Pantry Foodbank, chaired by Mr Terry Nelson of the Methodist Church. The Pantry Foodbank is a cross-community Christian organization with the mission statement: “With God's help, together, we can make a difference”. In his address at this the fourth AGM, Terry said that over those years the Pantry Foodbank had served 3,100 clients and provided some 31,000 meals. Because demand outdoes resources in terms of actual food, some has to be purchased from funds raised throughout the year, between £200 and £220 is spent each week in this way. Terry said there were three reasons for continued demand: first, the current ethos of austerity; second, changes to the benefits system, in particular the move to Universal Credit; and third, the fact that increasingly people are aware of the Pantry Foodbank. Help which is provided is intended as a stopgap for individuals in need and the organizers do not want to be a cause of dependency on the charity. Clients are helped only after having been properly referred. If anyone wishes to help as a volunteer, the number to call is 07517-766006. A lovely way to bring in the festive season. There will be lots of attractions at this year's extravaganza including barbecue, music by Jazz Jam, stalls, children's activities and teas. Admission is £3 with children free of charge. Canon Ian Ellis would extend a warm welcome to locals and visitors alike. "It's always a highlight of the summer season for means I know many others enjoy the get together and the unbeatable fete atmosphere. It's planned to be both indoors and outdoors, weather permitting, so anyone coming along will be able to enjoy the expected good weather to the full. Everyone will be most welcome" said Canon Ellis. Those attending may bring wine if they so wish. Please note that due to the 'blind' nature of the exits from the choir robing room and clergy vestry at either side of St John's, the Select Vestry decided that a new lay-out was necessary in order to avoid any risk of a child or adult exiting from either door being accidentally knocked down by a passing car. At the time of writing, a barrier is to be erected outside each door. At the choir robing room side of the church, the Select Vestry decided that the current parking lay-out has been unsatisfactory. Also for health & safety reasons, space has to be made to allow a fire engine vehicle to pass from the front of the church right to the Parish Hall. Sellable new and used goods to re-stock the St John's Saturday Morning Club's tables at their forthcoming sales. Contact 028-4372 2101 if local collection is required, or speak to George Hanna. Canon Ian Ellis, Rector, Mrs Liz Byrne, Sunday School Superintendent and the children from 'Stars on Sunday' at the annual prize giving on Sunday 25 June 2017. From June to September, St John's church will usually be open to the public every day, from approx 2.30pm to 4.30pm, to allow visitors to view the historic interior of the church, or, to simply enjoy a period of quiet reflection or prayer. Why not come and visit us! Everyone is most welcome. The Friends of St Johns who organise the provision of flowers to complement our beautiful church would like to draw parishioners attention to the flower list which is just inside the inner porch, on the left, opposite the hymn book shelves. This is a list inviting parishioners to provide flowers for the Holy Table. Some of you may have noticed that a new 'header' has been placed on the list - this is a beautifully worked cross-stitch completed by Vikki Methven and the Friends thank Vikki very much for this. This 'header' replaces the original art work completed by the late Aimee Bailey which mysteriously disappeared some weeks ago. Strangely, one set of nativity figures also disappeared around Christmas-time 2016! We would like to thank those who already provide flowers both for the large brass bowl and the Holy Table and would welcome additions to the rota, so please do add your name at some convenient date, perhaps at an anniversary. A report which was commissioned by the Select Vestry on the condition of St John's tower and spire has been supplied to us by surveyor Chris McCollum. The work done recently on the tower and roof was both necessary and important but circumstances led to us realising that there might be further difficulties. Unfortunately, this was confirmed by Mr McCollum and we were told in his report that major work is needed which could cost in the region of £150,000. This is, of course, a very serious situation for the parish. However, Mr McCollum has indicated that major work need not start for several years but that, in the meantime, temporary work will be required, which should cost in the region of £3,000. The Select Vestry has decided to proceed with the temporary work and at the February meeting will address the matter of a major, medium-term work project. It is anticipated that grants could be available to cover a substantial part of the eventual major repair and restoration work. The Select Vestry has appointed Jennifer White as convener of a new Catering Committee. Jennifer will gather together names of anyone willing to help with catering and if any parishioner would like to help with this, please let her know (tel. 028 4372 3944). Church Cleaning - Volunteers Needed! We are very fortunate to have a beautiful Church and modern Parish Hall, but we do need to undertake the occasional ‘deep clean’ to ensure that our premises are maintained to a high standard. Volunteers are needed to create a team of Parishioners who would be able to undertake periodic cleaning of the Church and Parish Hall. If you would like to join the team, or require more information, please contact Sharon Williamson on 07735-373068. The diocese’s 10th Annual Bible Week will be held each evening at 7.45pm from 30th August – 2nd September in Willowfield church, Belfast. The speaker in 2016 will be the Revd Dr Iain Provan who has been the Marshall Sheppard Professor of Biblical Studies at Regent College, Vancouver, since 1997. He will take as his theme, 'The Big Picture: Reading the Bible for All That’s There'. Prayer ministry will also be available every night. Saturday 4th June was our annual outing, this year to the Enniskeen Hotel for a beautiful lunch followed by a walk around the gardens for those that so wished. Nineteen members were made welcome by Eileen and all enjoyed the fun and friendship in a very relaxed atmosphere. The weather was beautiful and this rounded off a very successful year for St. John's Mothers' Union. This year Mothers' Union is 140 years old (130 years in Ireland) and members have been lights in the world as they have shared the love of God through their witness and service. We remember with gratitude God’s blessings through the years, and those who have gone before us, but we would also want to celebrate our current achievements and look to the future with faith. We wish you all a safe and happy Summer break and look forward to seeing you all again in September. The Select Vestry recently agreed that we enter into a mission link with the Revd Keith Scott and his wife Lyn who will be returning to work with the Church Mission Society Ireland in the Diocese of Northern Zambia. They were partner missionaries with us some years ago when they served in Zambia for the first time. We were delighted that Keith was able to preach in St John's at Morning Prayer on Sunday 12th June. Keith and Lyn will be going off to Zambia in the near future and we probably won't see them again for another three years or so! However, Keith and Lyn will keep us updated about their work while they are in Zambia. We are delighted that the Revd Dr Donald Watts, former Clerk of the General Assembly of the Presbyterian Church in Ireland, will be our guest 'Month of Mission Preacher' at Harvest Thanksgiving. 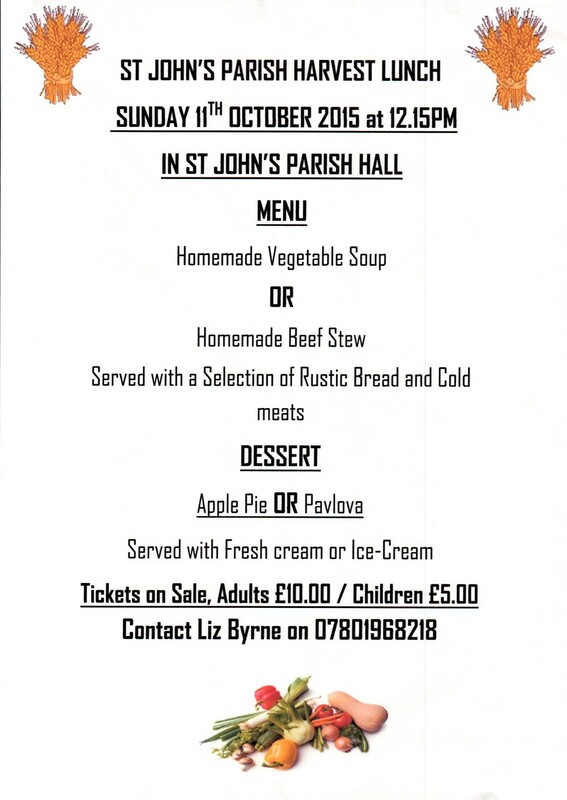 Parish Harvest Lunch is 11th October at 12.15pm in St John's Hall. Tickets: Adults £10 and Children £5 can be obtained from Liz Byrne 07801968218. Fantastic afternoon at St John's on Saturday. A very big thank you to Finbarr Keaveney for the musical entertainment and making this such an enjoyable occasion. Thanks to everyone who came along and supported St John's - it helps us so much and is really appreciated. And finally....... thanks to our Fund Raising Group and helpers for all their work to make the event a success. Canon Ellis pictured withVice Chair of the Pantry Foodbank Granville Crory, Margaret Ritchie MP and Barbara Porter (Public Health Agency). Naomi Baillie chairperson of Newry Mourne and Down District Council with Terry Nelson at AGM of Pantry Foodbank. Suzanne is being ordained in St Mark's Parish Church, Newtownards on 6 September 2015. Parishioners are very welcome to attend. Another enjoyable Messy Church for everyone who attended on Saturday 22nd. With a theme of 'God is Love', fun and fellowship was much in evidence. Thanks to Liz and her team for hosting the event. More photographs are in the Photo Galleries. Click here! Festival of Flight - St John's car park will be available to the general public for car parking from 9.30am on Saturday morning. A donation of £5 towards church funds per car. Tea and coffee will also be available in the Parish Hall from 9.30am until the air displays commence at 3.00pm. The sun shone for St John's Annual Summer extravaganza on Saturday 4 July. The event was well attended with adults browsing the stalls and children having fun trying to hook a prize duck or having their faces painted. It was a time to relax, enjoy the tea and refreshments and sit in the glorious sunshine listening to Jazz Jam who provided the musical entertainment. Our thanks to all those who organised the event, helped out on the day and to everyone who came along. A lot of enjoyment was had as well as raising the superb amount of £1600 for church funds. Make sure to check out the photographs in the photo gallery. Click here! The Rector, Canon Ian Ellis, distributed the prizes to our Stars on Sunday children. The Best Attendance cup was awarded to Joshua who only missed one Sunday throughout the whole year. Stars on Sunday Superintendent, Liz Byrne, congratulated Joshua on this great achievement. Stars on Sunday will resume in September. Our first Messy Church event was well supported by families within the parish and the wider community. Children participated in a range of arts and crafts, activities, singing, games and refreshments. A great night's entertainment was had with music Jazz Jam and New Harmony.